Model T Ford Forum: What would you call this? 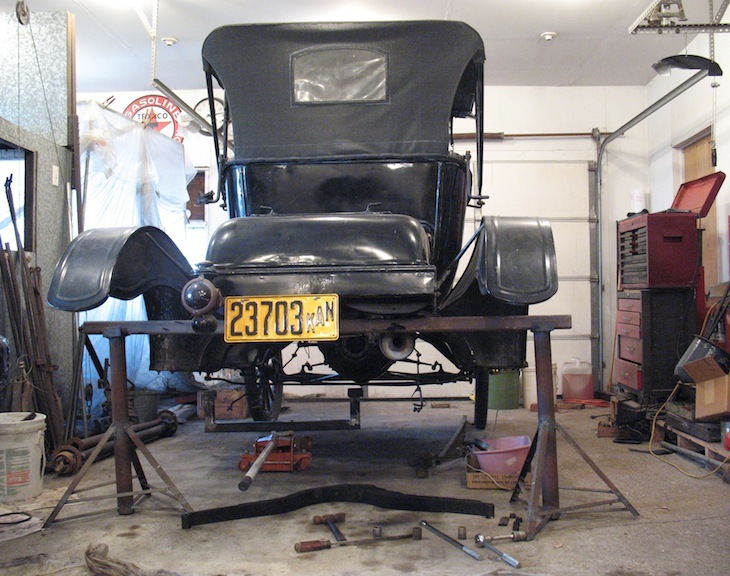 Model T Ford Forum: Forum 2014: What would you call this? I'm indexing photos so I can find them. In most cases coming up with a brief label or description is easy. In the case of spark plugs, for example, I could call a picture Edison spark plug in one of my two lists, and Spark plug, Edison in the other. But some pictures aren't quite so easy to easy to describe in a few words beginning with an obvious keyword. What would you call this one? Well Steve, I think it's gonna go downhill from here. The Edison spark plug Backfired and blew the rear end loose? I would call it "rear end removal". Keep it short and sweet. and my wife said don't say it! It seems Henry is prophetic, or at least observant. "Back to the Future" Flux-capacitor conversion -- don't need a rear-end, wheels, or a road where you are going? Or have you discovered "Flubber?" Just remember, if you go faster than the speed of light, your headlights will not shine worth a darn. This is a pearl of Model T wisdom I have never run across before. I am guessing that it applies to both gas and electric lights. Here's another one: If a Model T backfires in a forest and there is no one around to hear it, did it make a sound? Jelf over does it again. "Muffler bearing replacement"
I dunno about "prophetic" Steve. Some things are just easier than others to see coming. You know, like a fast freight train with the whistle blowing and the light flashing. When I was in Natchez a couple of months ago we took a horse and buggy ride around town. The driver said that we were facing the "Yankee End" of the horse. I can be serious once in awhile.